There's no info on the cost of the toll or how long it would be in place. But if the toll is too high, through-traffic can easily use Interstate 210 with a minimal distance increase. They also suggest giving discounts to local traffic, so pass-through traffic will pay most of the project cost. Needless to say, I have some issues with this. 1) What's to say that the Feds don't come up with the needed funding for the LADOTD-proposed upgrade to the Calcasieu River Bridge, which also includes upgrades to I-10 through Lake Charles proper? Why is it assumed by the SWLA Chamber that tolls are absolutely necessary to construct the new bridge? 2) If I-210 will remain as a "shunpike" for I-10 through traffic, and local traffic will shift over to I-210 to avoid the tolls, then how exactly will these private firms generate their revenue, exactly? Also, will this ultimately become an incentive for some New Urbanist to push for simply tearing down I-10 through Lake Charles and diverting it through I-210, while converting the existing I-10 into one of their precious "urban boulevards"? 3) Will this become a precedent for other major projects in Louisiana? If we do this for I-10 in Lake Charles, why not Baton Rouge or New Orleans? Will I-49 South through Lafayette be next for tolling? What about I-49 through Shreveport? Or, do we just toll every Interstate in Louisiana just to get some private contractors rich and sell our infrastructure? Privatizing our public infrastructure sure worked for Indiana and Texas, didn't it? 4) The current I-10/Sampson Street interchange in Westlake on the western approach of the Calcasieu River Bridge is currently in a very environmentally risky area (PCB contamination). Is there any assurance from the SWLA Chamber that this issue will be resolved with private funding before the new bridge is built? Existing clearance of the I-10 Calcasieu River Bridge is 135 feet. The finished grade elevation is 152 feet 10 inches. 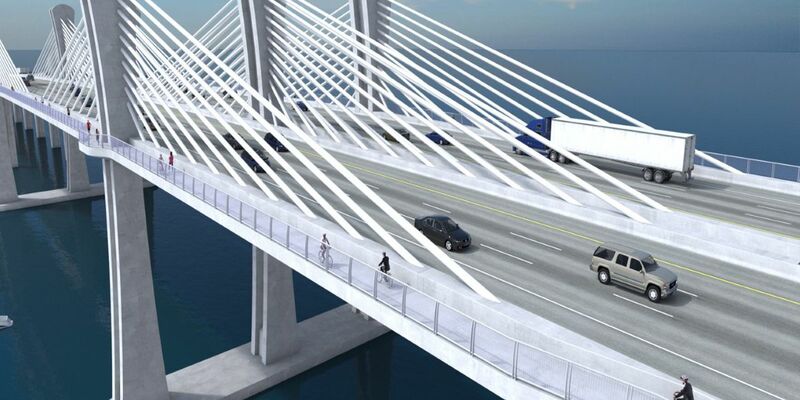 The proposed bridge's finished grade elevation would be 95 feet.